The debate between in-person and online training has been prominent since elearning was first introduced. Research shows benefits of both, and defenders of both sides vehemently argue their points. However, there is a way to maintain the advantages of both without sacrificing any learning. 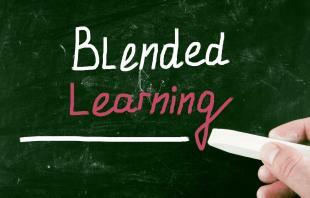 Known as “blended learning,” it combines elearning and traditional classroom-esque interactions. eLearning has been shown to increase student enthusiasm, cost effectiveness, and in many cases, retention and student ability at the end of the course. However, there are also numerous benefits to keeping traditional interaction and communication in training. Below I’ve shared some tips on how to supplement your elearning and create a blended learning program that will help employees reach new heights. There are traditionally three types of interaction in learning. The first interaction is between the student and what he or she is learning. This is where elearning excels. Online learning is linked to stronger complex understanding and reflection, as well as exploration of multiple viewpoints. However, it doesn’t work as effectively with in-depth exploration of a single idea or research, activities that typically increase comprehension and engagement. Below are some tips to help you create great content-student interactions. Encourage employees to do additional research if a topic brought up in training interests them. It will help with retention and keep them invested in the material. Furthermore, research works better with elearning. Assign a written assignment with the training. Writing will help students develop deeper understanding and comprehension. Make sure the elearning component of your blended learning program includes interactive portions, as retention increases when students have the chance to apply their learning. This interaction, typically where elearning suffers, is where the expert or teacher interacts with the student, whether directly or indirectly. Teacher involvement with students is linked to student learning, and the type of continuous feedback that instructors offer is linked to better and faster comprehension by the student. In online training, however, there is usually little-to-no instructor interaction. So how can you supplement your elearning to make sure employees are getting the best training possible? One important aspect of teaching is the ability to give feedback at multiple points during the learning process. Give employees chances outside of the course to demonstrate their knowledge and skills, and provide quick feedback on their performance. Independent research has been shown to replace certain aspects of instruction. By giving employees leeway to explore a training topic that interested them, they will not only gain the retention discussed above, but also cognitive benefits that come with in-person training. Encourage experienced employees to spend time helping new ones. Experienced peers can replace traditional instructors, and the workspace will be more collaborative and supportive as a result. Often thought of as the most important interaction, the quality of peer interaction is linked to retention, satisfaction, and success in learning. Interaction with classmates can range from one-on-one discussions to debates and conversations with dozens of students. The best way to supplement elearning successfully is to introduce classmate interaction. Try these tips to make sure your training is as effective as possible. After a group of employees goes through online training, have them get together and go over the material covered. Encourage them to ask questions, discuss the implications of the training on the jobs, and come up with ways to apply the training to their jobs. Encourage employees to share experiences, ideas, and thoughts through online discussion, as that enables employees to train at their convenience and still have access to interactions. Make sure that any communication, team-building, diversity, or other similar training includes team-building activities to cement the lessons. eLearning offers an efficient, convenient and effective training method, but you can create an even stronger program with blended learning. Offer your employees the opportunity to interact with one another by utilizing these tips. If you’re interested in learning more, check out Creating a Learning Culture Through Blended Learning or Leadership Development with Blended Learning.